Now we are through the darkest part of the winter, it is time to look forward towards the comming motorcycle season. At Tourstart we will do this by participating in the motorcycle exhibition Hamburger Motorrad Tage. The 2012 exhibiton on HMT was a great success, and we have the same booth again, B04EG/045. We look forward to welcome you 25.-27. January. This is a picture from last year, and we do look forward to many guests again this year will visit Tourstart booth. 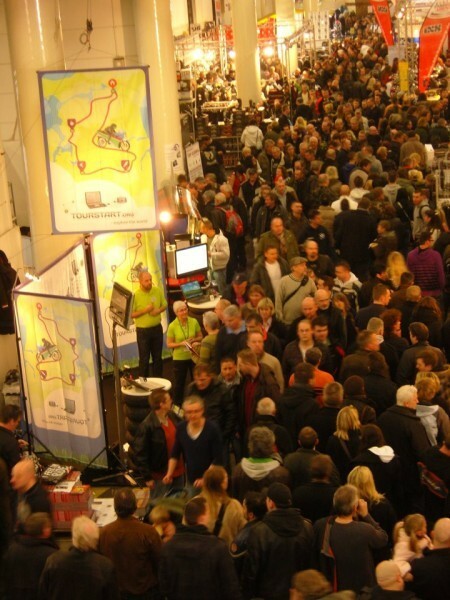 Last year there were more than 53.000 visitors on the exhibition, which is the largest motorcycle exhibition in the northern part of Germany. Come and visit us for a demonstration of our web or app where you can see how easy it is to find an event, motorcycle tour or plan a motorcyce route. At the Hamburger Motorrad Tage Tourstart will present our iPhone app for the German motorcyclists for the first time. And on the exhibition we will release our German version, so now the app support Danish and English and German language. Visit us and get a demonstration of Tourstart free app for motorcyclists. We look forward to welcome you on the Hamburger Motorrad Tage.